14 NovGet us to the Coast! Just kidding, Interior BC is ridiculously nice. 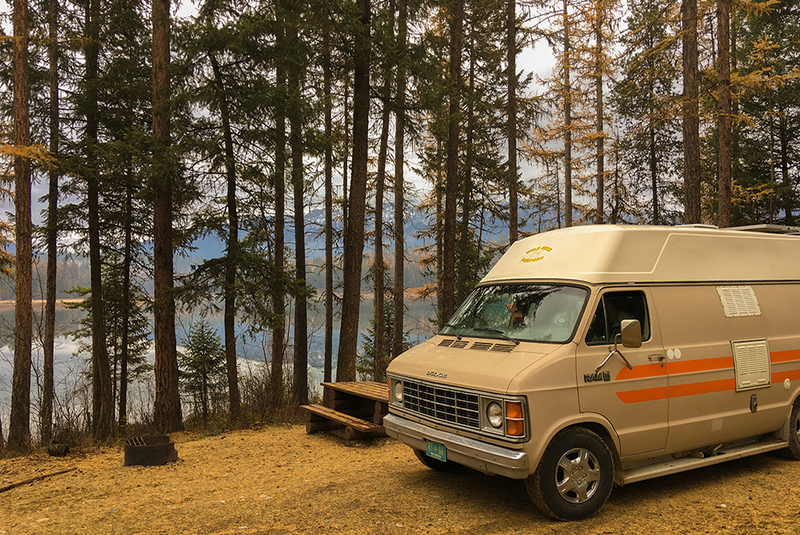 We took our time getting across the province and found some really incredible camping spots in Jaffray, Salmo, Keremeos and Chilliwack, British Columbia. In the interest of engine stress on Clemie, we decided to take the Crowsnest Highway again to get from Alberta to BC. 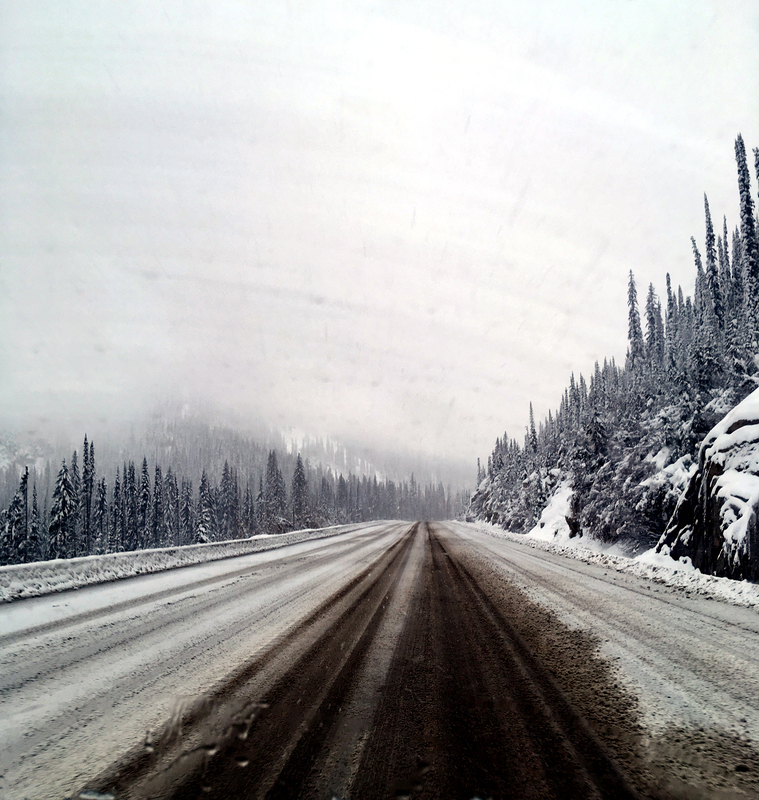 Highway 1 through Golden and Kamloops is crazy beautiful but has more tricky mountain passes and we got word that the Coquihalla between Merrit and Hope had recently had a snowstorm so bad that it had to be closed – yikes. We took it as an opportunity to find new spots along the way that we didn’t check out last time. We passed through Fernie to get to a wicked spot near Jaffray called Suzanne Lake. It’s a secluded recreation area with plenty of trees and a lake with a mountain view. Being November, it was a bit chilly but this would probably be a super cool place to swim and boat in the summertime. 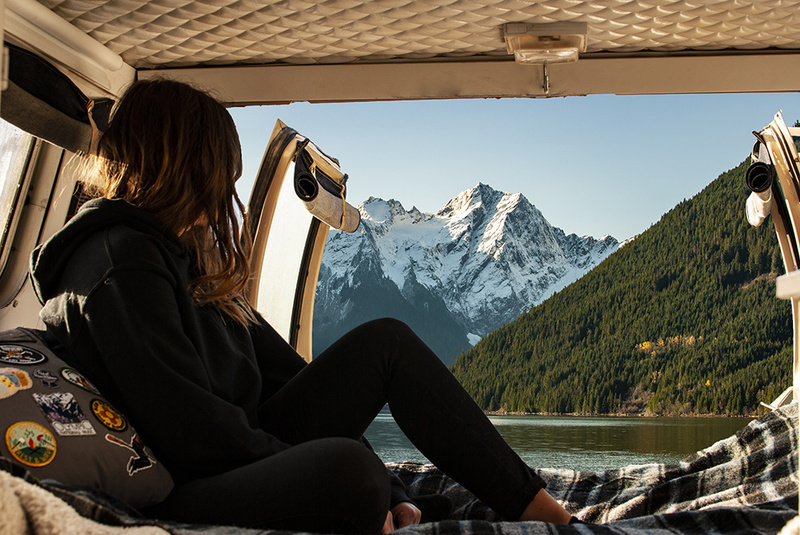 BC is absolutely killin’ it with the free recreation areas. It’s so refreshing to be in a province that actually wants you to get outside and enjoy your public land. 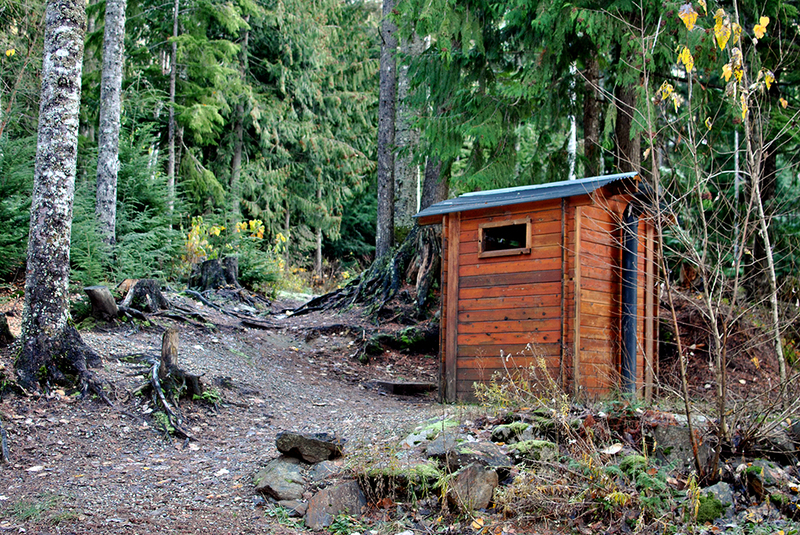 They’ve established many of these free user-maintained recreation areas that make for perfect dry camping spots and even spoil you with an outhouse. It’s wonderful how easy you are to impress when you live in an 80 sq ft van with no running water. After squeezing in a workday in Cranbrook, we geared up for the mountain pass we had been dreading: The Salmo Pass (Kootenay Pass) between Creston and Salmo. Our engine was in much healthier shape this time around but it’s still a bit nerve wrecking when you’re going up a steep uphill for what seems like an eternity. Signs at the bottom warned of slush and snow which seemed far off in the midst of mild temperatures and a misty rain. You can feel the air temperature drop as you ascend and suddenly everything – including the road – was covered in snow. Reaching the summit was nothing short of beautiful but turned the stress onto the brakes for the way down. We always just put it into low gear and tag along with the transport trucks to play it safe and thankfully it paid off. If you’ve done this drive and can’t understand our sentiments, it’s probably because you weren’t driving a vehicle that weighs over 10 000 lbs and pulls to the right. 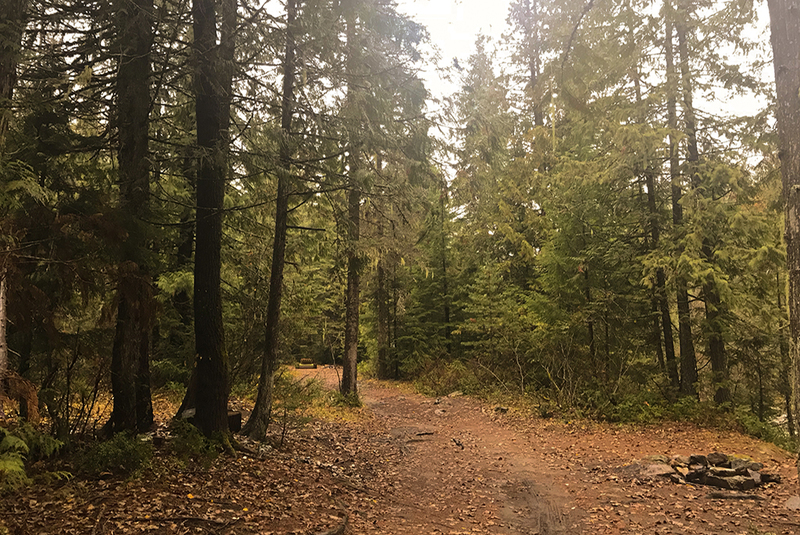 We made our way north of Salmo to another recreation area called Erie Creek where we came face to face with a logging truck on a narrow dirt road. We had to reverse all the way until we were in a spot with enough room for the truck to pass – as always, I was very happy Justin was driving and not me. Once we got to the spot, we had a beautiful rainforest-looking campground all to ourselves with a neighbouring creek rushing by. It then began to rain consistently until morning but hey, you can’t win ‘em all. 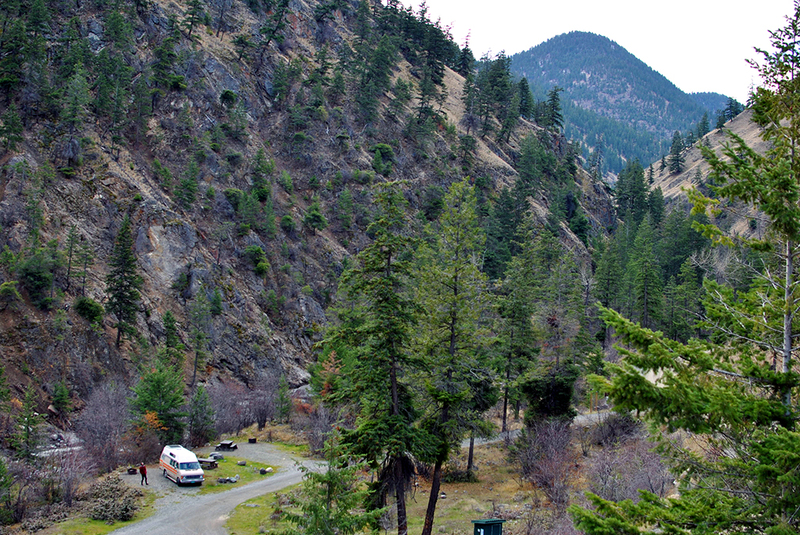 We kept on cookin’ through Castlegar and Osoyoos before heading to another great BC recreation area near the Similkameen River in Keremeos. The drive the next day through the Hedley-Princeton area all felt very familiar but the mountain passes that followed seemed to take us by surprise. We took the Crowsnest Highway in the summer heading east and must have blocked out of our memories how steep and winding the road is around Copper Mountain and Manning Park. Anyway, it wasn’t anything too crazy and was beautiful everywhere you looked although our poor ears didn’t know what to think with all the elevation changes. When we reached Hope we were disappointed to hear that forest fires and rockslides had closed off access to the Skagit River area. 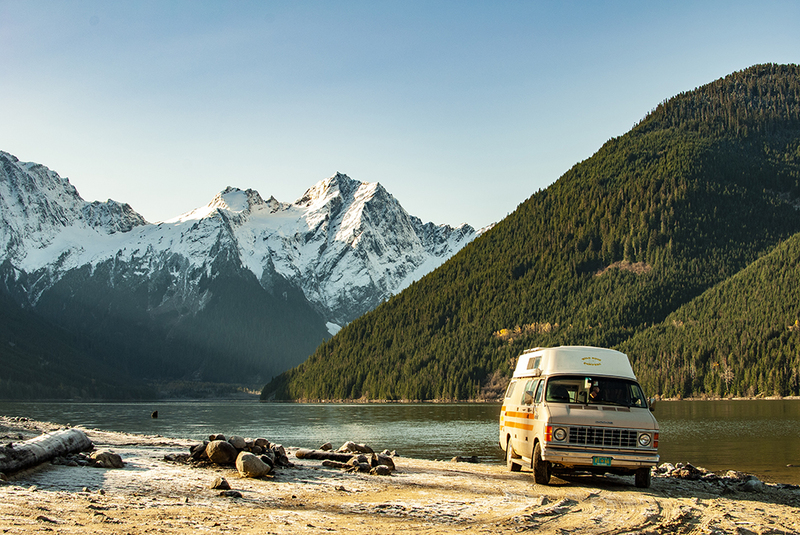 With some hesitation after reading several cautionary tales, we headed toward Chilliwack to make our way up a mountain to a BC Hydro recreation area called Jones Lake. We heard the road was rough and required 4×4 but after doing a bit of research, it seemed like our only challenge would be the steepness. And steep it was. To access the recreation area, you have to drive 9 km (5.6 mi) up a mountain where the first 3 km is all super steep switchbacks. A little intense but all in all, not too bad on the way up. By the time we reached the lake itself (actually called Wahleach Lake), we had forgotten about the drive altogether and had to pick our jaws up off the floor from how beautiful it was. 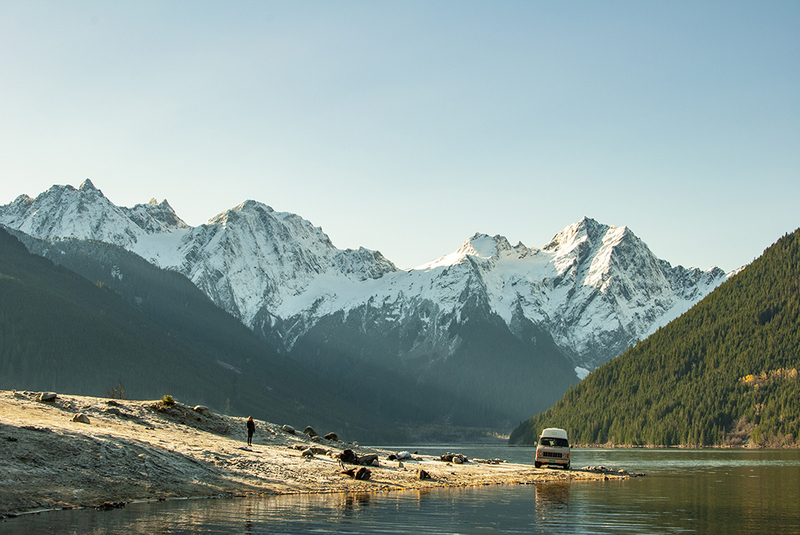 A large lake surrounded by trees and mountains would be our backyard for the night. We spent the night on the west tract of the recreation area and saw no one but a couple of Hydro workers leaving the site in the evening. 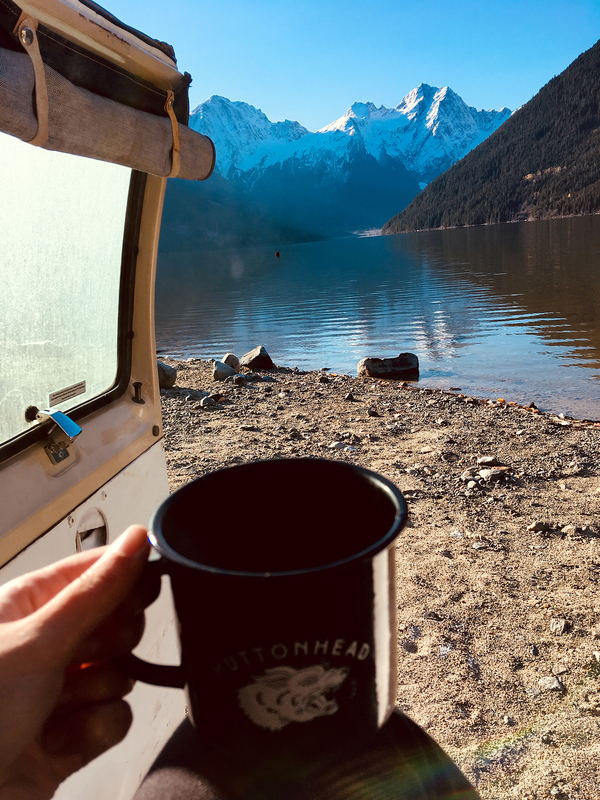 In the morning, we explored the other side of the lake and parked on a beach to have our coffee. It seems there are a handful of interesting A-frame cabins on the east side of the lake where other people put up with the steep drive to spend their summers. Having no one around made the whole place feel very surreal and made us super stoked to get to experience it. Vanlife has brought us to so many amazing places off the beaten track that we probably wouldn’t have otherwise been to. After a magical morning of sunshine and mountains, we got ready for the somewhat dreaded drive out. Remembering how steep the way up was, we knew the downhill was going to be pretty intense. The smell of burning rubber wasn’t so distant so we tried to give the brakes a break (ha) on a couple of the plateaus within the last few km’s of the mountain. Despite being in low gear and doing all the things we were supposed to, when we got to the bottom, the brakes were straight smokin’. Yup, our brakes had caught fire while struggling to hold back a very heavy van from dive-bombing straight into the surrounding forest. We were more so laughing than stressing and gave the van a chance to cool down before going any further. Somewhat luckily, there were huge puddles everywhere so driving through them a few times helped to sizzle down the steam. That’s probably not how most people in the area started their day but it was just another day in the life for us and didn’t stop us from thinking that Jones Lake was totally worth it. Moving right along, we made a stop in Abbotsford to gym and shower before making our way into Vancouver and officially reaching the west coast yet again. With double digit temperatures and not a flake of snow on the road, we undeniably felt relieved to have made it back across the country in one piece. The plan now is to spend a couple weeks in the Vancouver area before making the last leg of our journey for the year onto Vancouver Island. We started 2018 off in Mexico and are so lucky to have gone to all of the places that we have and not completely lost our minds (maybe just a little).